Life can be a tapestry, well even more so parenting is a like a tapestry it is so difficult to get the full picture on what is really going on. I often think I wish I understood my child more, what does he think, what does he feel does he even know? 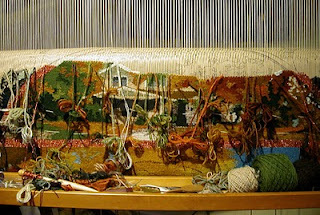 The idea with a tapestry you can see the threads from behind some days they look like a mess, well a lot of days they do but when you turn it around you can see the full picture. I constantly feel like I am trying to peer around the corner trying to see, but I can't reach. At the moment we are working through some testing with my son, general cognitive stuff. Last week we did some speech testing which had some surprising results and then this week we looked into the cognitive side and he did the WISC, which he did really well he worked for a full hour and made it through with a few short breaks to regain full concentration. Things that stood out to us are his love for numbers his weakness in auditory processing and skills in that area. Apparently he has a high processing speed so he can think quite fast and he does have a normal IQ. Next appointment we will look at it more and see what else the tests reveal. So often with my son there are two versions of him, what we see at home the loud, sometimes rude and bossy, funny and lively young man, and then outside of the home he is withdrawn quiet and non verbal a lot of the time. What was great this week and last week was that Josiah was able to talk to the psychologist, well it was a whisper so it still counts. But he was actually talking normally this is quite a feat, not just answering short questions or short subjects, things that he was thinking about his experiences. What was even funnier was that he was actually talking too much last week and it was interfering with the testing. It was something the both of us kept smiling at each other about. The question is, he struggles so hard to just do school that therapy often is very hard, I recognise the HUGE difference between what he is like during the term and what he is like in the holidays. It is so dramatic. What changes can I make in this area to make this issue a little easier, it does become a huge obstacle to therapy. I am also recognising the impact of his sensory processing issues are having on him and the associate fatigue, shut downs and low arousal issues. More on that in my other blog Sensory Processing Disorder and Selective Mutism. For now I am enjoying the fact that my boy's psychologist gets to see the hidden Josiah what a privilege. Do we really need to know EVERYTHING that is going on, do we have to understand everything? Why does mystery become a source of anxiety? 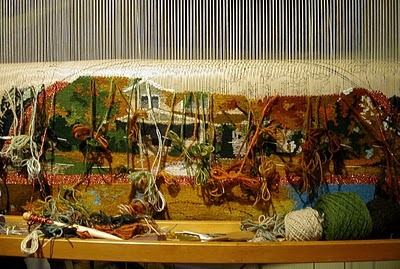 Secondly maybe the tapestry is not finished yet, if we shortcut the process we may miss out on the beauty of the finished task. Contentment is a quality we all need to chase after. The ability to be peaceful no matter what the circumstances are, could be or should be. Hey if we figured this out, then most of our problems would cease to exist, it would be a high and lofty goal. The question is do we allow ourselves to be at peace?